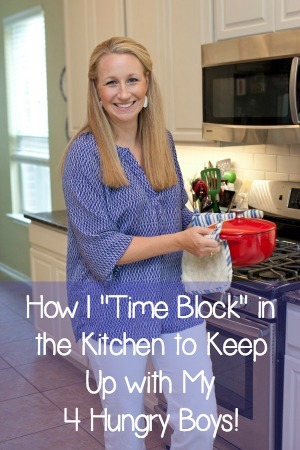 How I “Time Block” in the Kitchen to Keep Up With My Hungry Family! They say that the kitchen is the heart of home and that is certainly true in our home. I think that planning “time blocks” in the kitchen is one of the most important keys to keeping my home running smoothly, keeping “one step ahead” of myself, and not feeling like I’m drowning as I keep up with the never ending food needs of my 4 boys. A few weeks ago, I was on a phone call with my Extreme Grocery Budget Makeover members and the subject of “how do you keep up with it all” came up and this is what I shared with them. 5pm rolls around you are wondering what’s for dinner, nothing is thawed, you forgot to soak the beans, or you thought you had a can of tomatoes for chili, etc. Breakfast rears it’s ugly head every.single.morning and on some mornings, cranky children who aren’t quite awake yet only make the breakfast experience even more tense. You end up tossing cereal into a bowl with haste, because you forgot to pick up eggs again. Meals feel like a chore and end up adding to your daily stress! BUT. It doesn’t have to be this way, I promise. I want to share my method with you for keeping a handle on mealtimes, meal planning, prep, and cleanup. Here’s what I asked my Grocery Budget Makeover friends, “Do you have a set time every day to be in your kitchen? Like, the exact same time every day?” The response, NO. In order for me to stay one step ahead of myself and my hungry family, it is imperative that I set aside two blocks of time each day for meal planning and meal prep. But first, how I arrived at this “time blocking” thing. A few years back, a step dad said to me, “As soon as you figure out that you HAVE to do a load of dishes every day, and a load (or two!) of laundry every day, all of a sudden life as a homemaker isn’t so overwhelming.” Why? Because you just make them a habit, you are grateful for running water and a sink and a dishwasher and that you can afford laundry soap, and you just make them part of your day and your routine. Routine, habit & an attitude of gratitude and all of a sudden the laundry and dishes are no-big-deal. Now, apply this same concept or philosophy to meal planning and prep. Over the past few years, I’ve created a system that you might already be doing but you don’t know it yet. Or you need to tweak it to make it better or smoother. Or you need to become more protective, like I am. I am crazy protective of my “time blocks.” Like, I don’t ever (well, rarely…this did happen recently!) schedule appointments or activities during these times. Sometimes I “get way ahead” on the weekends with a baking session or freezer cooking session. But during the week, I am wicked protective of my time blocks. The morning time block isn’t usually a problem, as I’m generally home at 6:30 am 😉 But the afternoon time block, I have to be cautious and careful not to schedule into that time. My time. My time in the kitchen. Physically schedule this into your day until it becomes a habit. Try to make it the same hours-ish each day, or at least the same amount of time. Write out what’s going to happen in each time block, as not every day will be the same. Work hard to make it a habit and just part of your day. Make eggs, heat sausage, and make toast for breakfast. And/or pour cereal. Boil 1/2 dozen eggs for lunch boxes for the week. Pack lunches for the 2 littles. Oversee lunch packing for the 2 bigs. Set out shelf stable ingredients, like rice and diced tomatoes, out on the counter. This is my visual reminder about what’s for dinner and helps me remember when exactly I need to start cooking, depending on the meal. If a slow cooker meal, quickly thaw the meal and add to the slow cooker. Clean up from breakfast­ wipe counters and oversee kids rinsing dishes. This is when the dinner prep and sometimes the next morning or lunch prep happens. Cook rice, cover, place in fridge to be reheated later. Bake chicken, divide in half­ one portion for tonight’s dinner of chicken sandwiches and the other half goes in mixer to shred for chicken salad later in the week. Prepare vegetables for dinner­ – wash, chop, refrigerate. Chop ahead for lunches as needed. Shred cheese for dinner, slice some off block for snacks. Add peas and cinnamon to shopping list. Put extra berries in small plastic containers in fridge for snacking and lunches. While we are eating dinner, bake muffins for breakfast or lunch boxes. After dinner, we will run to scouts, music lessons, basketball practice, etc… and end back up at home where dinner is either ready in the crockpot or needs just a few minutes to prepare. Depending on the night, we eat before or after activities…but I’m 99.9% of the time working from 4:45 to 5:15 or 5:30! The benefits to keep this schedule can make a big impact on your family. It can help you save money, eat healthier, feel less stressed, save time, waste less food, and just feel more confident in how you manage your home and your kitchen. Keeping these hours sacred have made a huge difference in how productive I am in the kitchen, and from feeling overwhelmed by the fact that my boys never-stop-eating!!! If you’d like to join the waitlist for my next Grocery Budget Makeover class and be notified about when registration is open again this August, please drop your email below! In your “tips” you say to write it out because not every day will look the same. Would it be possible to give more examples of what other days might look like, especially for the evening block? I love this concept! However, I have one question about breakfast: when do you eat? Do you make yourself something after the kids are off to school or do you sit down in the middle of your block to eat with the family? Thanks for the great idea! I totally agree! Dinner time is family time and if done efficiently, Mom will be happier, and, therefore, Dad and children are happier. I tend to spend another block of time teaching my children cooking and food prep. My youngest is 8 and my oldest 24 with 6 others in between. They fix their own breakfasts and lunches with waffle Wednesday’s or Saturday’s. Most Wednesday nights we do breakfast for dinner and Dad helps. Also nearly every week my husband and I have date night and the 15 year old fixes hot dogs and Mac n cheese or they assemble their own pizzas. The other 5 nights I do as you and set out dry goods with an hour in the evening for throwing it all together. It’s the food shopping block I have more trouble managing. I try to do it within an hour or 2 once a week, but usually I forget something or we run out of something! I’d love to hear about the grocery budget makeover class! !